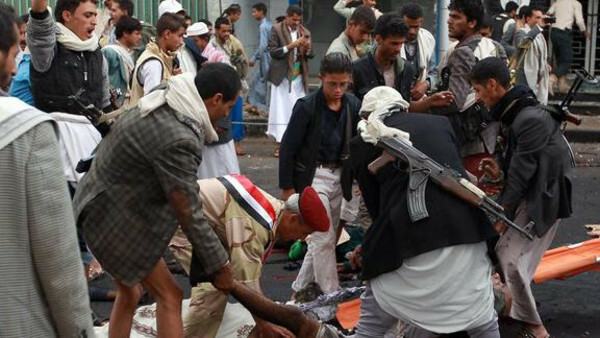 JNN 12 Nov 2014 Sanaa : A bomb attack on a gathering of Shiite Huthi fighters in central Yemen on Wednesday killed dozens of people, military and tribal sources said. The blast targeted the residence of a local tribal chief in the central town of Rada that was being used as a camp by the Shiite militia, who have overrun the Yemeni capital and other parts of the country, a military source said. The explosion was the heaviest to hit Rada since the Huthis took over parts of it last month, the official said. Residents said the bombing had been felt across the town, which is home to a mix of Sunnis and Shiites. The military official and tribal sources said “dozens” had been killed in the dawn attack. It was not immediately clear how the bombing was carried out and nobody has so far claimed it. Yemen has been dogged by instability since an Arab Spring-inspired uprising forced former strongman Ali Abdullah Saleh from power in February 2012. Militiamen and Al-Qaeda militants have sought to fill the power vacuum. The Huthi fighters, who have long been concentrated in their northern Shiite-majority highlands, overran the capital unopposed on September 21. But they met fierce resistance from Wahabi tribes and Al-Qaeda as they sought to expand their control to coastal areas and regions south of Sanaa. Al-Qaeda claimed twin attacks early Saturday that it said killed dozens of Huthis in the region of Rada. The turmoil has raised fears for the West and the Saudi Arabia that the Arabian Peninsula nation, which neighbours oil kingpin Saudi Arabia and lies on the key shipping route from the Suez Canal to the Gulf, may become another Shiite Led State, for which Al Qaeda is being injected in the country to counter their Perceived threat. This entry was posted in Jafria and tagged Al Qaida, Al-Qaeda, Ali Abdullah Saleh, Rada, rebel fighters, Shia Houthi Fighters, Shiite Huthi, tribal sources, Yemen. Bookmark the permalink.